WASHINGTON D.C. -- While at the White House to meet President Obama, the Cleveland Cavaliers spent some time with First Lady Michelle Obama--and did the Mannequin Challenge. Meanwhile, President Obama declared that you learn a lot about people when they’re down--but he wasn’t talking about the election. Mr. Obama saluted the NBA’s Cleveland Cavaliers for rallying from behind to defeat the Golden State Warriors and end a Cleveland pro sports title drought stretching back to 1964. That comment came shortly after Mr. Obama met with Donald Trump, who won the White House race to succeed him after a campaign in which the president declared the businessman unfit. Mr. Obama singled out several players for praise, but particularly focused on LeBron James, who won the Most Valuable Player award during the championship series. Mr. Obama called James one of the greatest players of all time and said it’s not just power and speed that make James great, but his unselfishness and work ethic. “You saw it in those last three games,” the president said. 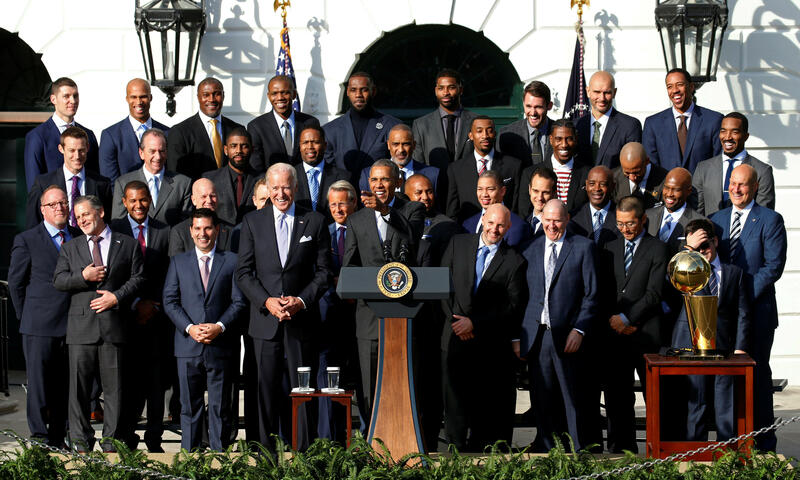 Mr. Obama said the Cavs also exemplified a growing generation of athletes who are using their platforms to speak out. He noted, as examples, that Kevin Love has worked to combat sexual assault and James has worked to reduce gun violence. “It is part of a league-wide effort to build stronger communities all across the country, including holding open conversations so we can begin to bridge divides,” Mr. Obama said.